No 8 High Street was built around 1830, possibly as a town house or perhaps it has always been a shop, it has certainly been a shop premises with accommodation over at least from around the 1830s when a sketch, shown below, illustrated the building with bow shop windows either side of the entrance door. 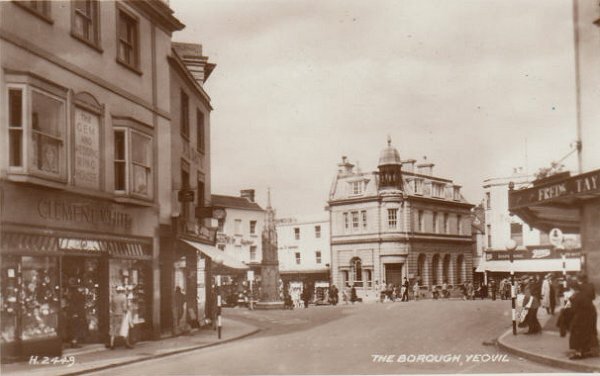 At this time it was the premises of Benjamin Ryall, a linen draper and also the last Portreeve of Yeovil, who occupied the building until his death in 1856. From 1864 the premises were family-run jewellers' shops. Whitby's Yeovil Almanack Advertiser of 1898 listed it as the premises of jeweller Charles Fox and Whitby's 1903 and 1907 editions listed it as the premises of jewellers Munford & Son. From 1911 the premises were those of watchmaker and jeweller Clement White. Shop, c1830: ashlar stone colour-washed, the roof hidden behind a parapet. A 3-storey not quite symmetrical facade of 3-bays in Regency style. Modern shopfront to ground floor, with 6-panel doors simply set on either side, the left-hand being wider and having a margined fanlight, the right-hand door having a plain fanlight; the facade above has pilasters framing the 3-window bays and a further blank 'bay' on each side: the centre at first floor level has a recessed blind panel with Soanian architrave flanked by angled bay plain sashes: a simple band course divides off the second floor windows, which are plain sashes set in panelled architraves, and the whole is crowned by a classical cornice with low parapet, raised slightly over central bay, finishing with cast iron railings with an intertwined pattern. There is a rendered chimney stack to the right. This sketch, made by Madeley to illustrate his map of 1831, shows the Borough seen from High Street - roughly the view seen today from the north end of King George Street. The Shambles is to the left and the Market House is to the right. 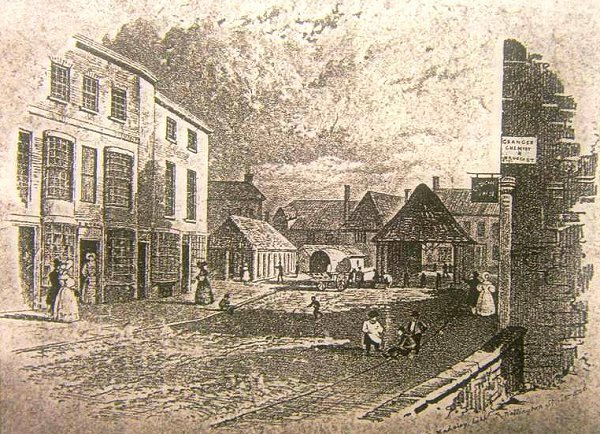 The buildings at far left still stand today, that to the left is Clement White's shop, today's 8 High Street, at this time occupied by Benjamin Ryall, a draper whose name appears above the door. 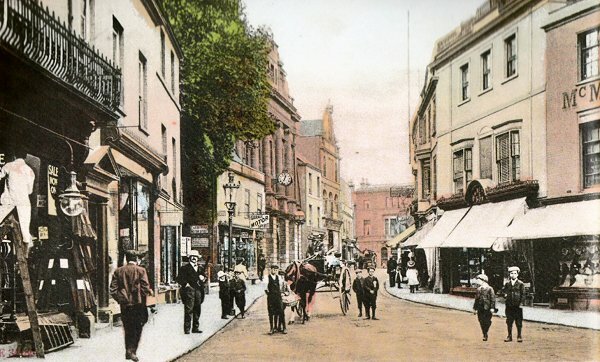 A hand-coloured and heavily touch-up photograph of High Street dating to 1907. No 8 High Street is at right. If you look closely you will see that most of the people, all of whom have no shadows, have been added to the photograph in the photographer's studio. A hand-coloured postcard of High Street dating to about 1910, just before the Town Hall got its new clock tower. By this time No 8 had its own flag pole! 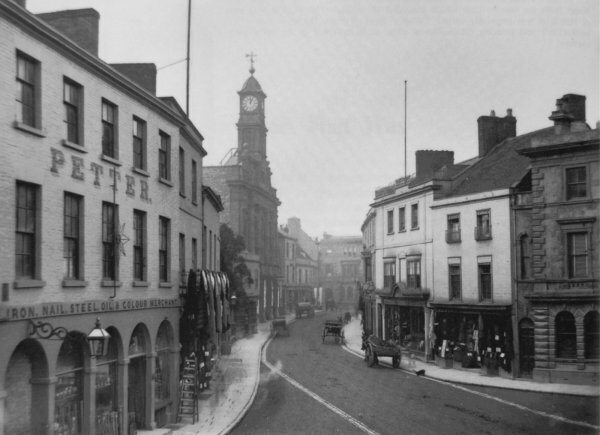 This photograph of High Street dates to about 1914, by which time the Town Hall clock tower had been built. 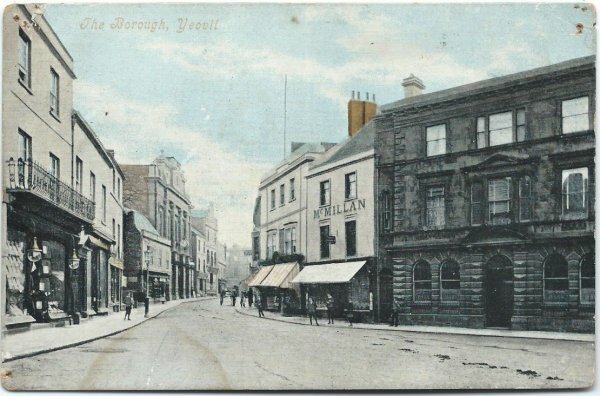 A A 1930s postcard (the Medical Hall is still there) looking across the Borough with No 8 High Street, at extreme left, occupied by Clement White. 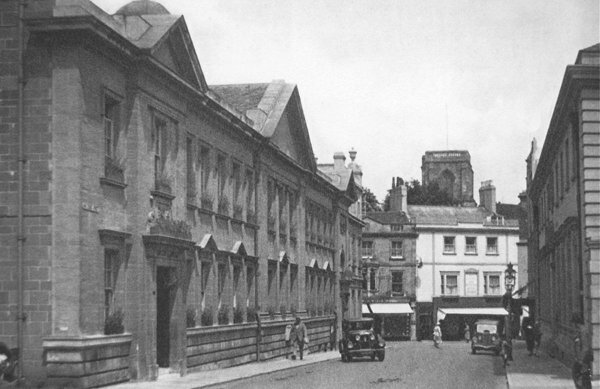 King George Street photographed around 1935. No 8 High Street is the white building (without its clock) directly ahead. 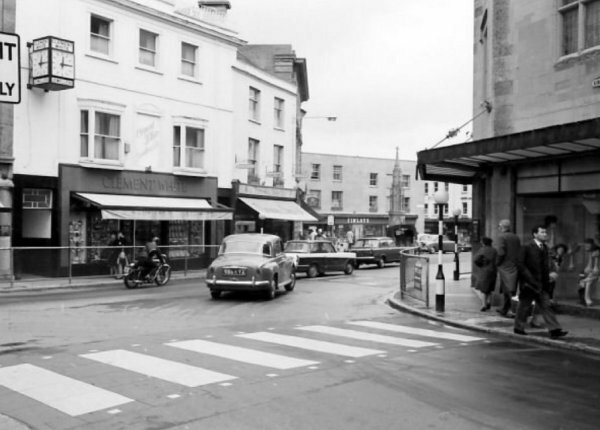 Photographed in the mid-1960s little has changed since except King George Street is now pedestrianised.... and Clement White's clock has stopped!